Lately I gained a lot of tummy fat...I was naturally slim all my life before(bluekkk but its true im almost underweight) but just lately my weight dramatically increased...When I come back from Korea,I just weigh 41kilos...and now...taraaaa 50.8...And Im only 156cm tall..Its not that I dont like having some meat at my body...but I become annoyingly fat...my legs are still as skinny as twig but my tummyy ahhhhhhh..stressss..SSSS....hihi...I need to reduce my weight and that tummy fat! !Because Im not a sport people and I hate fish and veges,,I do exercise and jogged,but the result is not as fast as I wanted so I decided to CHEAT. 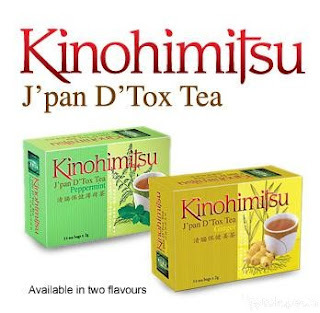 So I asked my friend who has tried detox...She has really slim tummy..stressSSS again.I asked her what's the secret and she introduced me this.. So this is my 3rd day...I feel my tummy fat start to lose a little(or me imagining that ha..ha-_-")..But I did feel more comfortable with my body especially my stomach...But from the reviewers some say that it works for them and some not..So it up to your body I think...Just for me I hope this will help eliminates my tummy fat and of course improve my health. Hi, do note that there may be side effects for continuous consumption. I suggest you may consume it on alternate days or twice a week. You notice the ingredients for the detox tea includes buckthorn bark, which is also an ingredient found in laxative. This explains why it take effect after 8 hrs. Although each satchet weighs 2g, not sure the contents for this particular ingredient. You may look up into wikipedia for laxative and look under stimulant. Hope this helps you to understand more. I know I am getting know-how daily by reading thes nice articles.